The MTA is hosting a workshop this Saturday, November 17th (preregister HERE) . . . for those of you (like me) who will be out of town - tell the MTA what you think about potential fare hikes HERE. This interactive workshop will provide an overview of the MTA s financial situation and suggested options for adjusting fares and tolls. The feedback from the workshop will supplement the formal fare and toll public hearings and give you an additional forum at which to provide the MTA with informed, meaningful input about which options you prefer and your priorities for the future of the MTA. While the traditional public hearings that begin on November 5 allow MTA customers to make a brief public statement, the November 17 forum will provide more information and an extended conversation that will inform the MTA Board before it considers the budget in December. This is one I really would have liked to attend . . . but written testimony goes into the same public record, so even if you can't make it, let the MTA know we need better transit options, including enhanced F/V/G service on the Culver Line . . . and that fare hikes in this environment are unacceptable. First, the City and State need to pay a "fare" share of the costs. Out-of-context development in Carroll Gardens is changing our streets. Can growth and preservation be compatible? Join us for a panel discussion on landmarking and related issues. Q. What would it take for me to vote Republican? A: Noach Dear running as the Democrat. See the Brooklyn Paper for a small selection of the reasons why. Electing a truly, truly awful Democrat is worse than electing a Republican. It's easier to defeat a sitting Republican in this county than to oust a bad Democrat. The NYT has a story today about the high cost of travelling in our region, and further hikes looming on the horizon. 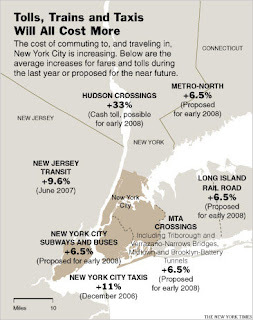 The handy chart above, (credit: NYT; click to expand) details the pain, and most of it falls on New Jersey commuters. Of course, all that pain is good for something. The NJ Transit hikes will help pay for a new tunnel under the Hudson River, and the Port Authority increases help pay for all new cars on the PATH system, as well as a total overhaul of the system itself. Unfortunately for NJ commuters, an $8 Hudson crossing toll means that the notion of giving credit towards congestion pricing for those tolls must be reconsidered. Let's call a spade a spade: these transit hikes amount to a regressive tax. The wealthiest among us are getting off light, as years of income tax cuts have gutted public financing for transit expansion, improvements, and maintenance. In New Jersey under Christine Whitman, income taxes were slashed, and property taxes, usage fees and every other conceivable way to squeeze money out of the lower and middle classes ballooned. In New York, transit funding was slashed by a sneering, incestuous Rudy Giuliani and the wooden, uninspiring George Pataki. We need to re-examine the inequity of a taxing system that balances financing for public works on the backs of the middle class. Mark your calendars - free Thursday nights in holiday season are not easy to come by. Via the Gowanus Lounge, the meeting will take place Thursday, December 6th. The meeting will take place from 6PM-8PM at the Belorusian Chruch at Atlantic Avenue and Bond Street. A lot of questions need to be answered about the impacts of development on pollution in the Canal, and on the impacts of flooding. Think about what happens to the Gowanus floodplain during a major hurricane or nor'easter. Now, what would happen if it were a dense residential enclave? What impact can we expect to see on the Canal due to global warming? And what is the city going to do about our (NYC's) continuous violation of federal water quality standards?